We are a leading Manufacturer of mica coated ceramic tape, fire cabinet wrapping tape, ceramic fiber wrapping tape, thermal ceramic wrapping tape, fire insulating tape and ceramic webbing tape from Ahmedabad, India. Fire Cabinet Wrapping Tape from asbestos warp and weft yarns, suitable for lagging for boilers and pipe lines, also used as thermal insulating materials. Thermal Ceramic Wrapping Tape textiles (cloth, tape and rope) contain a certain amount of binder material which is normally burned at lower temperature and does not affect the insulation property. Fire Insulating Tape tape is made from ceramic fiber yarn, by stainless steel wire reinforcement or glass filament reinforcement. 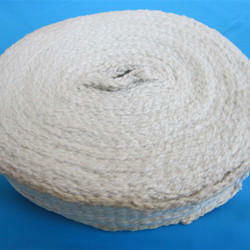 It is used as heat insulating materials and excellent substitute for asbestos tape. We are counted as a renowned manufacturer & supplier of Ceramic Webbing Tape which is available in various sizes and shades. 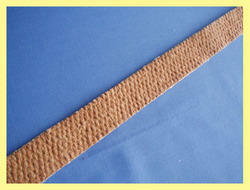 These tapes are manufactured in bulk and as per the client’s requirement. These tapes are processed with superior quality raw material and tested under the vigilance of our quality controllers to deliver quality and defect free products. These tapes are available in the market at reasonable prices. 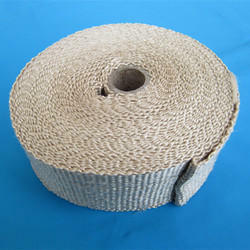 Our company is well known in the market to manufacture & supply Ceramic Vermiculite Coated Webbing Tape. These coated webbing tapes are manufactured to fulfill the requirement of the clients and available in various specifications. 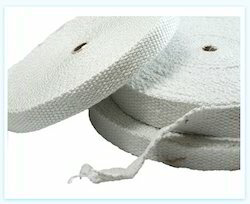 These coated webbing tapes are high in demand in the market for their quality and cost effectiveness. 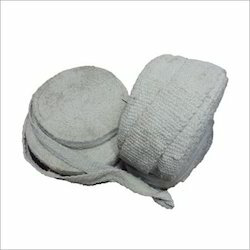 It can be easily available in the market at reasonable prices. 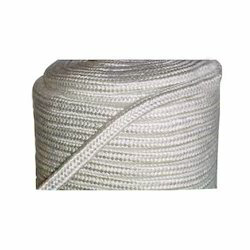 Owing to our expertise in this domain, we have been able to offer our clients an excellent quality range of Asbestos Webbing Tape. Manufactured from quality assured raw material with the aid of latest machines, this tape is widely used in different industries for varied applications. The offered tape is available in different lengths and thicknesses as per the specific requirements of clients.